Current advice on Vintage American guitars? Buy whatever you can afford and hang onto it! Well, not usually why we buy guitars, we kinda buy things we actually like and want to play… but.. Well, this one falls into both camps. 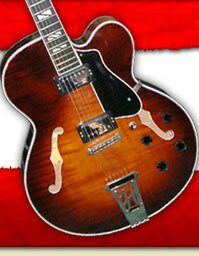 It is probably the most affordable `60’s guitar for sale in town at the moment and one of the coolest to boot. The 365 was the “dress-up” version of the 360, a guitar that helped write modern music history… This one is worth the price of admission just for the stunning finish and the cool beyond calculation checkerboard binding.. and the original (somewhat battered) case. Affordable, playable and Cool?? A definite Global Vintage Guitar!